… and the on-air copy whose work you'll hear on video after the jump could have just been making a pair of mortifying, awful mistakes. Endless amounts of writers from all fields still use that phrase, and for those of us that only think about Lin's ethnic background about once-in-whenever someone does something stupid, we have to go easy until we find out just who put the mistakes together. Knowing ESPN, though, we'll never know, we'll never find out its real intentions, and this will "go away" quicker than rumors of a potential human relations violation regarding the preparation of the gruel in 1930s Siberia. As a writer, I'm not picking my poison in trying to be safe in failing to deliver some third-hand slamming of what happened in Bristol on Friday night. If the editor in question pulled this as a joke, then he or she should be fired in an instant; and this is coming from someone that wasn't at all in favor of Jason Whitlock's firing (though I did get one Fox News joke out of it on Twitter). Whitlock's was an unfortunate attempt at humor. This play on words was more of a play on an ethnic slur, if it was intended to reference "chink" as "Asian," even if it was a smarmy joke from someone who is too dumb to know better. If this really was someone using yet another sports cliché that he or she has to fit into about 20 characters or less? Then that's different. A terrible, awful, oversight. A learning experience, no doubt, and a nice reminder that -- holy crap, this Asian-American kid is amazing at pro basketball, and we happily have a whole new set of double-entendres that we have to watch out for as writers. 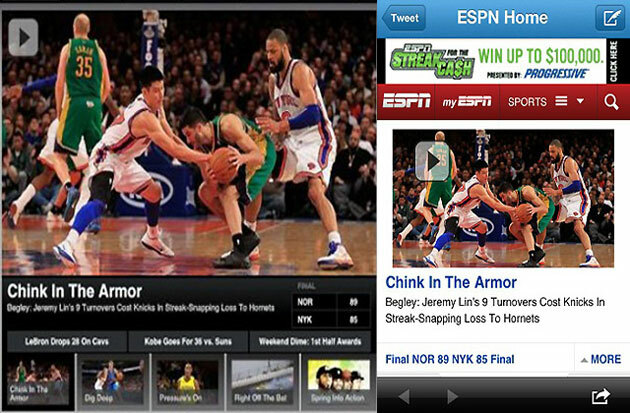 You, sick of this, are more than welcome to demand a swifter, and more transparent and public reaction from ESPN. So there you go. Nothing any of us should be happy about. It seems as if the "chink" comment had more to do with a racial slur than an oft-used part of a cliche referencing medieval armor. That saddens not only because of the racial implications ... but because someone would actually think a headline like that as clever or funny. Do these people have Twitter accounts? Can't they compare their output with anyone else's? Apparently this isn't the case at all. Link coming. • Kurt Busch to answer age-old NASCAR question: Car or driver? • Shine: Where is Monica Lewinsky now?